A brand is the perception others have about your company. Branding is about taking control of what your audiences think – and say – about your brand. But before you can successfully influence your audiences’ perceptions, you have to get absolutely clear on what you want them to think and experience. Brands that survive and thrive in today’s fast, saturated and commoditized business environment are strong, clear, differentiating and quick to adapt to the ever-changing marketing landscape. To fully understand the world in which your brand must thrive, you first need to develop a brand strategy – the context for your branding efforts. This is not the time to debate details or get tactical – this is the time to focus on research, analysis and planning and to answer some big-picture questions. Where are we today? This will help to assess and clarify your company’s vision, offerings and current positioning as well as audience perceptions of your company. What is our vision for tomorrow? This will help to uncover your big hairy audacious goal, growth strategy, business goals and priorities. What does our environment look like? This will help identify target audience profiles, competitive landscape, emerging trends, global and economic conditions, and any other internal and external factors that affect your business. Your answers will inform your brand. 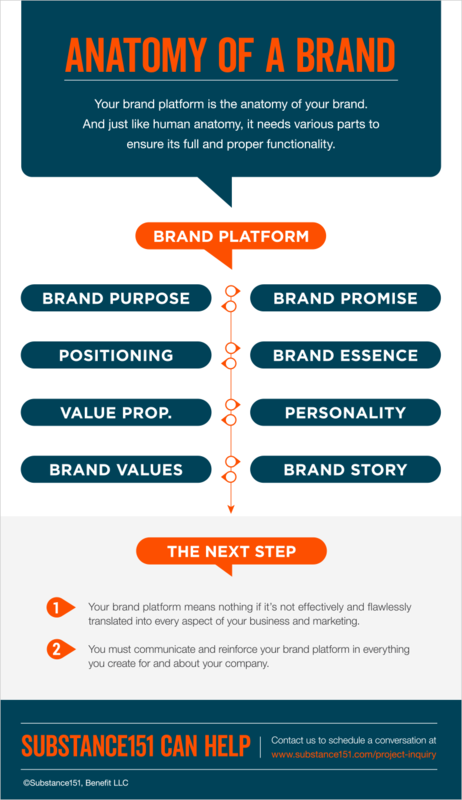 Your brand platform is the anatomy of your brand. And just like human anatomy needs various parts to ensure its full and proper functionality, so does your brand. Positioning: Your company’s distinct and identifiable place within its competitive set. Value Proposition: The tangible benefits of your company’s offerings; how you solve customers’ problems. Brand Promise: The one thing you want people to know and remember; the correlation you want your audiences to make with your brand. Brand Essence: A short mantra that captures the soul or essential nature of your company; its internal rallying cry. Brand Personality: What makes your brand unique and distinct from its peers and competitors (just like human personality). Brand Values: The values your company must honor in order to carry out its purpose, be true to its essence and express its personality. Brand Story: The story that best helps audiences understand, and relate to, your company, and is told through your marketing and the subtle signals your company sends in how it does business. Relevance: Will your brand platform connect to your audiences in ways that are engaging, authentic and meaningful? Resonance: Does it have the ingredient to elicit an emotional response from target audiences and connect with them on a personal level? Memorability: Is your brand platform setting the stage for a brand and for marketing that is memorable and able to break through the clutter? Attitude: Is your brand platform taking a strong enough stance to ensure the marketplace understands what you stand for? Aspiration: Will your brand platform give your firm something to strive for, uniting your team around a common a goal? Remember: You must communicate and reinforce your brand platform in everything you create for and about your company. Imagine how difficult it would be to create a memorable brand identity, compelling and engaging marketing materials, dynamic corporate culture and more with nothing but the general business facts to inform them. A brand platform is, in a big way, the very blood that courses through every cell of your company, bringing it to life and giving it its unique DNA. Still have questions? Schedule a free one-on-one conversation with one of our experts. Download our free Brand Toolbox, a guide we’ve developed to assist you with the branding process – from conducting your brand audit to smoothly navigating the process. Click here to download the entire Brand Anatomy infographic (PDF).